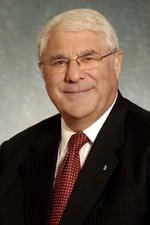 Fred Gorbet enjoyed a distinguished career in the federal government culminating in his appointment to the position of Deputy of Minister of Finance (1988-1992). He is currently Associate Director of the Financial Services Program at the Schulich School of Business at York University as well as serving on a number of corporate boards. He is Chair of the Board of ASSURIS, Vice Chair of Covenant House Toronto, a Director ofLAWPRO, and a Trustee of the North American Electric Reliability Council. He is also Vice Chair of the Government of Canada Audit Committee and is currently appointed by the Government of Ontario as Chair of the Steering Committee of the Task Force on Auto Insurance Fraud in Ontario. He was appointed to the Order of Canada in 2000.